Should You Pop Into Seattle’s Museum of Pop Culture? In 2000, Microsoft co-founder Paul Allen opened a nonprofit museum that he dubbed the Experience Music Project. In the next 18 years, the museum collected dozens of exhibits all dedicated to pop culture and went through a name change. I visited the MoPOP (the Museum of Pop Culture) this weekend to see if it’s worth the $26 basic online ticket price. Frank O. Gehry designed the 140,000-square foot building, which houses one of the largest indoor LED screens in the world. It’s a very weird-looking structure; apparently Gehry was inspired by the bodies of guitars, specifically the Stratocaster. 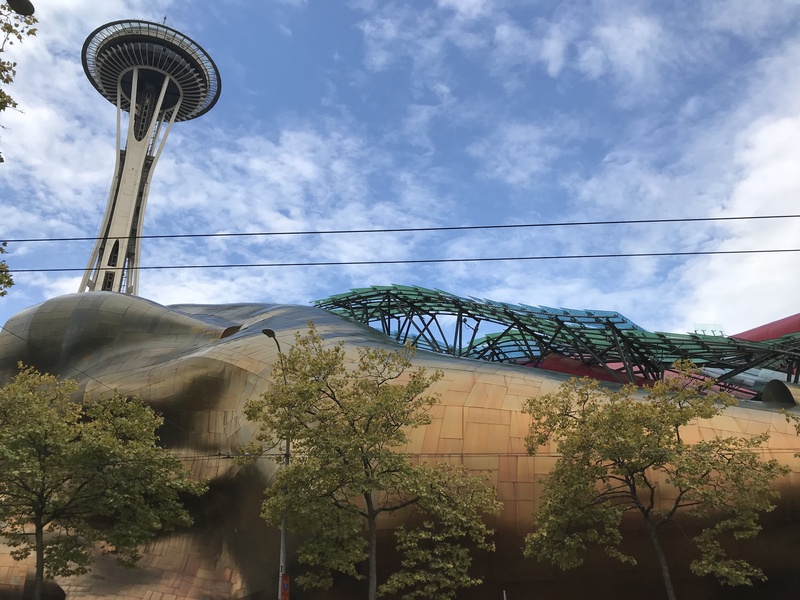 People are divided on the final product, with some calling it “a blob” or even “The Hemorrhoids.” Forbes named it one of the world’s 10 ugliest buildings. For a museum that celebrates science fiction, horror, music, and so on, the bizarre architecture is fitting. There are a lot of exhibits you can see with the basic $26 ticket; we spent almost two hours there. We went through the Sci-Fi Hall of Fame room, the Infinite Worlds of Sci-Fi, Scared to Death: The Thrill of Horror Film, the Sound Lab, Indie Games, and the Pearl Jam section. Objects include Dorothy’s dress from Wizard of Oz, swords from the LOTR trilogy, scripts and costumes from Alien and Aliens, Jack’s ax from The Shining, and so much more. The room we spent the most time in, however, was the Indie Games room. There are a bunch of games set up that you can play. They’re great for kids (probably at least 7-years old) and adults. “Little Nightmares” was there, a horror puzzle game that won the Indie Award at Gamescon 2016. The Sound Lab is another really fun area, especially if you can play keyboard, guitar, drums, or you fancy yourself a singer. There are soundproof rooms where you can record and mix your own songs, as well as little cubicles where you can play around with instruments if you don’t want to record anything. Even if you can’t play, a screen with audio and visual descriptions teaches you the very basics, like playing a scale along with a hit song. It was the busiest exhibit, so expect to wait a few minutes. So, should you go? Considering a ticket to the Space Needle is between $30-$40, the cost of admission to MoPop is definitely worth it. Even if you don’t pay extra to see the special exhibit, there’s definitely enough to keep you busy. If you’re a big movie geek – specifically sci-fi, fantasy, and horror – it’s pretty exciting to see real props and annotated scripts. I’ve been obsessed with Lord of the Rings for years, so seeing the Witch King’s sword, Gimli’s ax, and Andúril (Aragorn’s sword) made my middle-school self very happy. For my husband, he had a similar experience seeing the exhibit of “Walking Dead” aquarium heads from the Governor’s era on the zombie show. The first Starbucks opened in Seattle and could be considered the home of modern coffeehouse culture in America. What were coffeehouses like in the more distant past?